The Disk Coral is a mover, it looks stationary but watch out... it will even climb and flip! The Disk Corals from the Fungia genus are quite hardy creatures that easily move about on the substrate. They are solitary, free-living corals and they use water and current to get where they want to be. They can actually move up to 12" per day (30 cm). They have also been known to climb slight slopes up to a 30 degree angle, and to right themselves if they get flipped over. As the name implies, the Disk Coral Fungia spp. are mostly round, though an occasional specimen will be elongated. They range from saucer-like shapes to dome shapes and can also be dented. Other common names they are known by are Rough Feather Coral, Common Mushroom Coral, Elongate Mushroom Coral, Distorted Mushroom Coral, Plate Coral, Disc Coral, Tongue Coral, Fungus Coral, and Chinaman Hat Coral. Disk Corals are awesome animals with the unique beauty and characteristics of the Fungiidae family. They come in a wide array of colors that make them an attractive addition to your display. 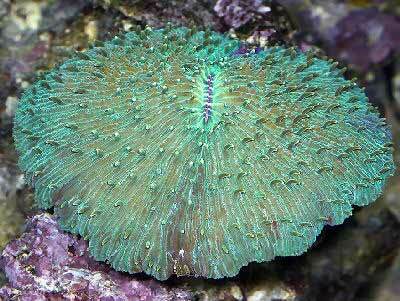 They are most commonly green or purple, but just name the color and the Fungia genus comes in it. Disk Corals have short tapering tentacles, which in the wild retract during the day, coming out only at night. In the Aquarium they will generally stay partly extended during the day, though quickly retracting if disturbed. These tentacles are nestled between the blade-like septal teeth that radiate out from the center. When young the Fungia spp. are connected with a stalk to rock work. Over time as the coral develops, the stalk gradually weakens and breaks, leaving a central scar. The scar is then gradually overgrown. All species of Fungia have wide slit-like mouths, often housing various parasites. In fact a bivalve gastropod Faungiacava eilatensis, is a parasite that lives exclusively within the mouths of Fungia. It is not known why the mouth of the Fungia spp. are so large. But Disk Corals have been observed eating jellyfish, possibly as a main source of food for them in nature. The Disk Coral can be easy to care for if it has have proper lighting and water movement, proper substrate and placement, and regular daily feeding. Low to moderate water movement is needed and it likes bright light. This coral sends out feeder tentacles at night. It also excretes a heavy mucus coat in response to rough handling or when coming in contact with other corals. The mucus contains strong toxins that can severely damage other corals that are not in its same family. Care must be taken in the placement of this coral to prevent fatal injury to other types of corals. The Fungia fungites needs to be fed daily or it will starve to death. They do have large mouths, however, abstain from feeding them a side of halibut! The tan and white mottling and pink outer edge is one of the few colors this coral comes in. They will also come in brown or tan with the outer edging a continuous pinkish purple or sporadic spots of color. Growing to 12" diameter and being found only on substrate, they will require "roaming" room since they do like to move around. The Fungia fungites spends all of it's time on the substrate, so this is a mad skill that this Common Mushroom Coral needs! This LPS will spend the beginning of it's life on the rockwork but will eventually mature enough that it breaks away and wanders off in search of a meal! While they are easy to care for, they do grow to about 1 foot across, so a larger tank will be necessary eventually. Distribution / Background Fungia Coral Information: The Fungia genus was described by Lamarck in 1801. There are approximately 65 nominal species, around 32 which are true species, with 15 being found around Australia. Some common names these corals are know for are Mushroom Coral, Plate Coral, Tongue Coral, Disc Coral, Fungus Coral, and Chinaman Hat Coral. Also some variations on these such as Rough Feather Coral, Common Mushroom Coral, Elongate Mushroom Coral, and Distorted Mushroom Coral. The Fungia genus has been propagated in captivity. Where Fungia Corals Are Found: Fungia genus are found in the Western Central Pacific, in the Philippines, Papua New Guinea, the Indo-West Pacific, the Western Indian Ocean from Gulf of Alden to Seychelles, and in the Northwest Pacific in Taiwan. Fungia Coral Habitat: The Fungia genus inhabit reef slopes on the flat areas between the lagoons and the reef. They are found on rubble or soft bottom in areas that are protected from strong water movement. They are found at depths from 0 to 131 feet (0 - 40 m), though many are found in much shallower waters to depths of 82 feet (25 m). When they get sediment on them, they have the ability to "unbury" themselves in the substrate. They can also right themselves if they are overturned. This is done by filling their tissue with large amount of water, thus becoming more buoyant, and then using the water current as their mode of transportation. Fungia spp. have short tapering tentacles, which in the wild retract during the day, coming out only at night. In the Aquarium they will generally stay partly extended during the day, though quickly retracting if disturbed. These tentacles are nestled between the blade-like septal teeth that radiate out from the center. When young the Fungia spp. are connected with a stalk to rock work. Over time as the coral develops, the stalk gradually weakens and breaks, leaving a central scar. The scar is then gradually overgrown. F. distorta: The Mushroom Stony Coral is round with an almost flower pedal division in the skeleton. F. fungites: The Common Mushroom Coral has triangular septal teeth (long thin bones that run across the top of the fungia) and are brown or mottled. This species can get up to 11" (28 cm) and it is a shallower water dweller. F. echinata: The Rough Feather Coral can get up to 39" (100 cm)! They are slightly elongated with a 3 to 1 or 3 to 1.5 length to width ratio. This is a deeper water fungia. F. paumotensis: The Elongate Mushroom Coral can grow up to 10" (25 cm). It is, of course elongated with a central arch that runs the same distance from the perimeter, making an elongated rise in the middle. F. scutaria: The Oval Mushroom Coral or Disc Coral has long tentacles and can tolerate temperatures from 74 - 83 F (23 - 28 C), which is a little warmer range than other Fungia like. They are smaller, only reaching just under 7" (17 cm). F. simplex: The Tongue coral has several mouths in the ridge that runs down the middle of this long fungia. Difficulty of Care Fungia Coral Care: The Disk Coral Fungia sp. can be easy to care for if it has have proper lighting and water movement, proper substrate and placement, and regular daily feeding. This coral excretes a heavy mucus coat in response to rough handling or when coming in contact with other corals. The mucus contains strong toxins that can severely damage other corals that are not in its same family. Care must be taken in the placement of this coral to prevent fatal injury to other types of corals. Foods / Feeding Fungia Coral Feeding: The Fungia corals, like other large polyp stony (LPS) corals, have developed several feeding strategies. Through a symbiotic relationship with a marine algae, known as zooxanthellae, they receive many of their nutrients. They also capture planktonic organisms, food particles from the water column, and can absorb dissolved organic matter. In captivity, these corals need to be fed at least daily. They also need to be fed more often under lower lighting conditions. Feeding tentacles are usually visible at night. Fungiids also form mucous nets, at that time that you can put small amounts of shredded meat on this net. Aquarium Parameters A well-feed live rock/reef environment is what is needed for your Disk Coral, along with some fish for organic matter production. Have an open area of soft substrate or a rubble bottom for this animal, and do not put it on rock work. Provide a low to moderate water movement and medium to strong light. Place them on a soft substrates or rubble at the bottom of the tank The Disk Coral does not attach to a surface (rock, substrate, etc.). It is quite capable of movement and may move itself around a tank to find its own favorable position (as will other fungiids). Though peaceful with other Fungiids, this coral can be semi-aggressive toward other corals. It needs to be placed where it cannot 'walk' up to corals that are not in the Fungiidae family. Water Movement: Low to moderate, but not strong enough to remove the feeding mucous net. Compatibility and Social Behaviors Fungia coral is peaceful with pretty much all other genus and species within the Faviidae family. However it can be aggressive toward other corals, using their mucous net as a weapon, causing necrosis. With that in mind, place your coral where it cannot "walk" up to another substrate dweller that is not in the Fungiidae family. The Fungia genus will also reproduce asexually. Daughter colonies/polyps may form and they will form offspring from broken pieces. They have been known to start regenerating on a supposedly dead skeleton if left in the aquarium, producing daughter polyps. They will also bud new daughter polyps off from their edge, or decalcify themselves to regenerate a new offspring. In captivity, propagation of Fungia spp. can be done by encouraging budding of daughter colonies by scoring the tissue in between the "teeth" of the coral. Make sure the animal has been well fed and is healthy before attempting this type of fragmentation. Simply breaking the coral in half with gloves by using a wedge and hammer is crude, but works. To get a cleaner, more precise frag, using a dremel or other motorized saw works beautifully. You can cut pie shaped frags from a whole animal if you wish and they respond quite well as long as they can recover in clean water and are well fed. Potential Problems The Fungia genus should not be expanded when removing it from the water. Make sure to gently shake the coral until the tissue has receded before exposing it to the air. If they are not fed, they will die, since they have carbon requirements. Availability Fungia Corals for Sale: The Disk Coral Fungia sp. is very easy to find at pet shops and on line. Online they can run about $30.00 to $60.00 USD or more depending on size and/or color.